Hey, have you heard? Alley Art Amazin has finished its most ambitious project yet. It’s called “The Handoff”. It’s adjacent to the parking lot of The Post on Emma Street, just west of Public Road. I’m telling you, this mural reeks of gleeful merriment. You must check it out. Our very own Tif Choate designed and created this beauty. The funny thing is that the actual creating of the mural was the easy part. Getting an undulating metal wall scraped, power washed and prepped for less than a million dollars, now that took some work. We looked long and hard for painters, most wouldn’t even discuss it. A few agreed to do the work but disappeared early in the game. It wasn’t just workers who abandoned this wall, even the primer adopted a peeling attitude. We reached out to LOTA, city administrators, friends, fans and family, to little avail. It was just too daunting a task. Then we met Vivax Pro and our relationship with hard working, reasonably priced painters commenced. Bless these guys. They capped their hard labor with the lovely, “old truck blue”, awarding Tif and company a 60 foot by 15 foot madcap canvas. When you work with an undulating wall, measurements are skewed and lines need to be lengthened; it’s a crazy, weird challenge. Sensible measurements get lost in the wall’s curvious nature. At one point an entire chicken head disappeared into the fold of the waved wall. This is not the look our happy, peace loving team was after. Fortunately, Sarah Spencer helped Tif paint and figure out appropriate proportions. 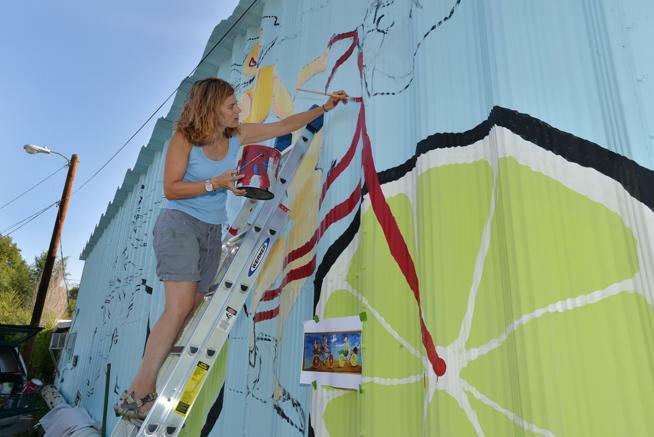 Painters Mary Pat Munding, Lynda Pinkerton and Tara Gale brought talent and can do attitudes. Jim Choate, Tif’s hubby and loving advisor donated a Saturday and his own artistic talent to the cause. Did I mention that Tif loves to work on ladders? Go figure. She was even smiling when she relayed the story of being stung by a bee. Everyone appreciated that the wall was shaded during the better part of the day. All in all the creation of the “Hand Off” was an upbeat experience. The opportunity to create “The Handoff” was bolstered by a generous donation by Dave Query and The Post. The Post folks were avid supporters from the get go and their employees created a steady and enthusiastic cheerleading squad. Isn’t that the very essence of public art? Hard working volunteers plus business donors plus an enthusiastic public and voila, a creative community blooms. We could not be more tickled. As days shorten and temperatures drop, brushes will get their final rinse and paint will be stored in garages and basements. Attention will be diverted to amplifying the potential of the website and raising funds for the 2016 season. One more thing, we really need to work on getting the installations sealed and that sealant stuff is costly, (thanks Jax for the 10% discount). If you like to paint and might want to seal some art or if you have any fun ideas on how to raise some money, please give us a call. Or, you could just give us money, we’ll put it to good use. Promise. New mural going up by the Post 8/27/15 Thanks Kyle!